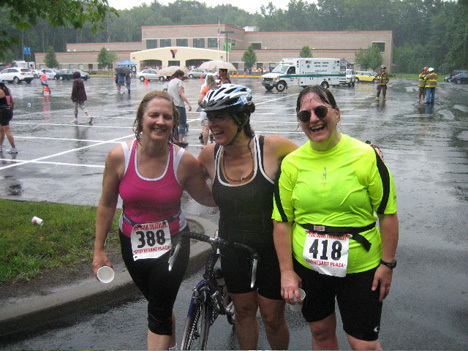 For the fifth year in a row The Wife competed in the Pine Bush Triathlon this past Sunday, July 13. She did her best time ever, one hour forty eight minutes and twenty eight seconds. With each year she moves slowly and steadily away from last place, crossing the finish this year as number 361 out of a field of 376 competitors. For those of you who don’t know about this excellent event, and haven’t read my post about it from two years ago, the race begins with a 325 yard swim across Lake Rensellaer. 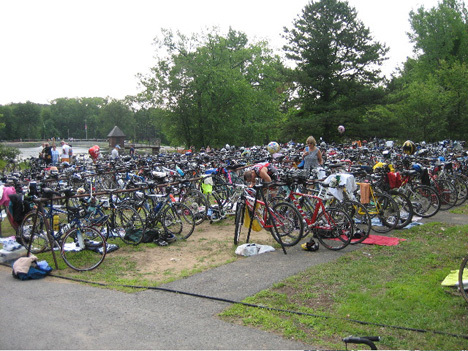 Then, after staggering bedraggled out of the lake and up a muddy slope, the competitors do a quick change of clothes (called a “transition”) and hop on their bicycles, which are parked in the bicycle corral. The competitors pedal their bikes 11 and a half miles to the edge of the parking lot of the Guilderland YMCA. They abandon their bikes in another corral and proceed to run for three and quarter miles, which is a little longer than the usual 5K race, through the godless suburbs fighting with automobiles. They loop back to the finish line at the YMCA parking lot to cool off in the spray of an upright firehose, and then eat all of the free bananas and hotdogs that they can stomach. 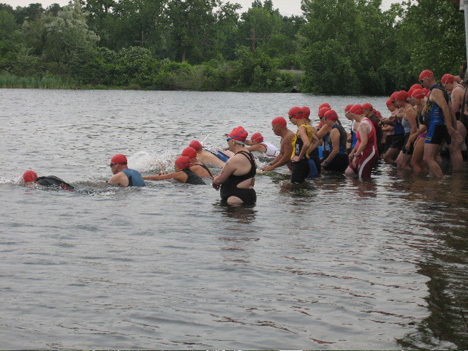 The competitors begin the race in ten waves, or “heats” that jump into the lake two minutes apart, each heat wearing a different colored bathing cap. Now, in past years The Wife was put into one of the later heats, but for some reason this year most of the old and fat people took off early while the young and rangy went later. I thought it was a nice change, at least the slower competitors got to finish the race earlier. “I’m not sure I like going early,” she told me while she waited in the absudly long line to get into the only ladies room. Every year it’s the same thing. Why can’t the organizers put a couple of port-o-potties out there next to the permanent restroom, just for the event? Surely either the City of Albany or the Guilderland YMCA can afford to kick in for an extra pooper or two at the start of the race. The Wife hadn’t quite made it into the ladies room when the siren sounded for the third heat. Fortunately, with my intervention, she was able to cut ahead of the line and empty her tiny bladder, barely making it in time into the water. And when she got there she hesitated before plunging. After she hit the water I could see that she was doing well. She didn’t stop to rest until she came to the left turn, which is at about a quarter of the distance across the lake. Swimming is her most difficult event, but this year all the practice she did over the winter at the Albany YMCA and at Bath House #2 paid off. I’d never seen her swim so fast or so evenly. Usually several heats that started behind her catch up and pass her in the water. Two years ago I waited so long for her to emerge from the water that I thought she’d been eaten by karner blue sharks. This year the leaders of the heat swimming behind were just passing her as she finished her swim. She staggered out of the lake with confidence. Did I say swimming was her most difficult event? Where she messed up big was the transition from swimming to biking. I swear she could have shaved ten minutes off of her final time if she could learn to change her clothes faster. And it’s not like she was changing everything right out there in the open so everybody could see her private parts. Like, none of the other competitors would pay attention anyway. Actually, a whole industry has grown up around the triathlon transition. 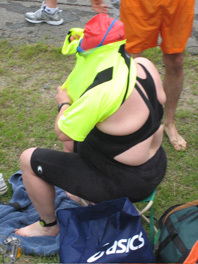 I saw quite a few competitors sporting fancy jumpsuits suitable for swimming, biking and running without having to change. Even The Wife had special quick shoelaces that tie with a tug. She needed a lot more than shoelaces. I watched her sit on her folding camp stool and screw around and poop around and fart around with lord knows what. Menwhile, the other competitors arrived dripping from the water and took off on their bikes. And still she tugged and poked and doodled as if she were at home in the AM and had all the time in the world to poke at her armpits or whatever. The Wife’s bright-eyed friend Claire Nolan, who was also competing, had asked her the night before if she practiced the transition for this race. “Uh, no,” the wife replied. Yeah, no kidding. Claire admitted that she hadn’t practiced transition for this race either, but with her it’s a different story. She’s a much more serious competitor, and has been happily encouraging the Wife to keep fit throughout the year. Among other things, Claire has been giving her regular swimming lessons, which has had great results. A year ago Claire had been looking forward to last year’s triathlon because she had just turned fifty and had become eligible to win prizes in the age 50 to 54 category. “I’m going to beat all of those old ladies,” she bragged to me before last year’s race. Sadly, she did not. This year was different for Claire. At the finish she was relaxed and confident, muting her expectations. She won third place in her age category. Excellent! At long last The Wife stopped doodling and took off on her bike. 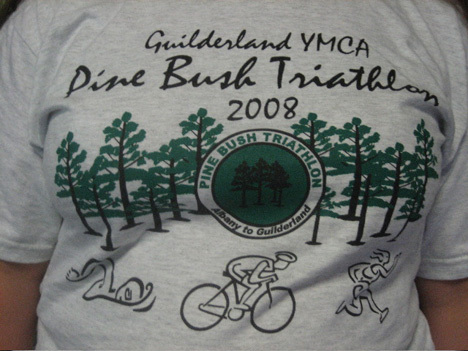 I drove out to the Guilderland YMCA in my truck (you don’t expect me to bicycle, do you?) and hoofed it down the long driveway to the bicycle drop-off corral, carrying The Wife’s clothes bag. And in a surprisingly short time she arrived on her bike to begin her run. After she descended by foot into the suburban wasteland, I had about thirty to forty minutes to kill before she approached the finish. I wandered over to the YMCA building to see what they were giving away. I didn’t worry about the contents of the two free hotdogs that I ate, the ground up rat bellies and dog snot and whatnot, but I was deeply concerned about the bad health effects of the high fructose corn syrup in the ketchup. I carefully selected a banana for The Wife. Eventually I got into position on the home stretch to wait for her. It seems to me to be kind of cruel to make the competitors run uphill at the very end of the race. But hey, these are triathletes, man. They’re supposed to be tough, they thrive on pain and abuse. However, it’s entirely unneccessary and completely unfair to make the competitors fight with suburbanite automobiles. 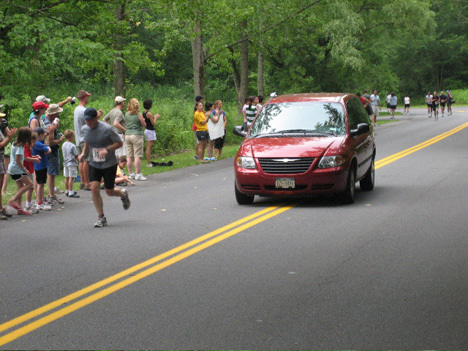 In properly laid out communities like downtown Albany or downtown Troy, the streets are closed to autos for the short duration of races. It’s easy for drivers in these cities to find alternative routes around the closed streets. Out in the suburbs, however, it’s impossible to do anything without driving. Suburbanites are required to drive, but they are only given limited routes to drive on. Because of all the stupid dead-end curvilinear streets, there are only a limited number of passable roadways that allow driving residents to escape their isolated dwellings. And of course they are effectively prohibited from walking or bicycling, except for special events like this one. Then, while I waited for The Wife on a roadway that had no curbs or sidewalks , it started to rain. Slowly at first, it came down like a waterfall. Of course I hadn’t brought anything to cover my head. Damn, I thought to myself as I vainly tried to find shelter under a tree, I sure do make a lot of sacrifices for The Wife. How I suffer for her! At last The Wife appeared at the bottom of the hill. I may have been grumbling and miserable in the pouring rain, but The Wife had a big smile on her face. 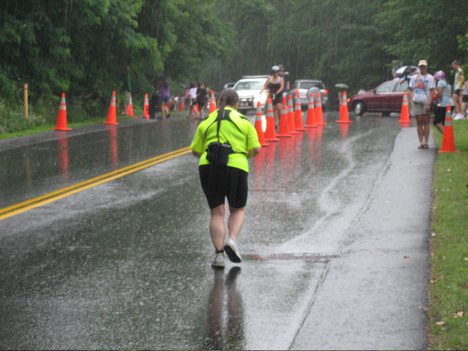 She told me later that the rain came at just the right moment to cool her off and make pleasant the final few minutes of the race. She crossed the finish line a bit flushed from the heat but happy and perky. “Let’s do it again!” she proclaimed. The only complaint she expressed, posing in the YMCA parking lot like a champion in the pouring rain, was that the firemen had turned off the now uneccesary firehose. “Just because of a little rain,” she said. So it was all over for the competitors except for the endless standing around soaking wet yacking it up and congratulating each other. While waiting, I suddenly remembered. It was time to present The Wife with her well earned reward for all of her athletic endeavors. I gave her a banana. She was absolutely delighted. Naughty Daniel, looking at his wife's chest. For shame!